"Itinerary was excellent. We saw and did many things every day. Transportation, minibus,..."
"Thoroughly recommend this tour. The Whitsundays are beautiful, and Fraser Island..."
"I'm overall glad with the tour. Steph was a great guide with big knowledge of the..."
"Such a good week in Sydney! Chloe and Caro really delivered a brilliant week and..."
"Professional operated, tour director Adam added to the experience and is a credit..."
"The trip was extremely well planned and organised! I had an amazing time and felt..."
"Very good tour, happy with everything." "Marshall the tour guide was amazing and the trip itself was great! Would book again..."
"Excellent tour exploring the island with lots of time for trekking, seeing wildlife..."
"This trip was just insane! I never thought that you can experience so many wow-moments..."
"We had a fantastic time on our Secrets of Esperence tour! The bus journeys were long..."
"Robert Skinner was humorous, relaxed, owned good phychological skills to bond the..."
"Be prepared for lots of driving but it's so worth it! Dolphins at Monkey Mia and..."
"The Ultimate 8 Tassie tour was really great because we had a fantastic guide in Justin...."
"After two months of independent travel in Australia and NZ which I loved but sometimes..."
"Stef's enthusiasm and the company ensured I had a good time during this trip." "Did my Ultimate OZ week back in Jan 2015 and loved it! 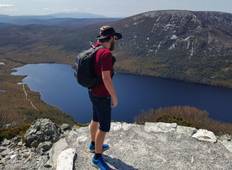 Was a great way to start my..."
"Travelling to Australia has been a long time goal for me and choosing a tour company..."